The WI makes great cookies, but we also use them to give you the best experience on our site. The WI is campaigning to get members talking about organ donation. Find out how you can join the conversation. The NFWI notes that three people die every day whilst waiting for an organ transplant. We call on every member of the WI to make their wishes regarding organ donation known, and to encourage their families and friends, and members of their local communities to do likewise. At the 2014 Annual Meeting, the WI launched a campaign to get members talking about organ donation. 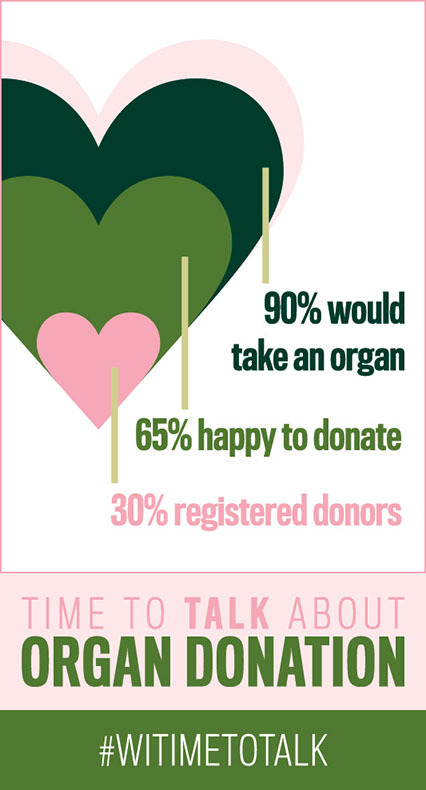 Time to Talk about Organ Donation calls on every WI member to consider this issue carefully, come to a conclusion – whatever that might be – and then share it with their family. Over 1,000 people signed the Organ Donor Register as a direct result of the campaign. In Greater Manchester, WIs came together to launch a regional campaign encouraging even more people to sign the register. Partnering with Manchester City Council and NHS Blood and Transplant, they ran a summer of activity to raise awareness. To find out more about the campaign, download the Time To Talk Legacy Pack. The National Federation of Women's Institutes of England, Wales, Jersey, Guernsey and the Isle of Man is Incorporated in England & Wales as a Company Limited by Guarantee - No. 2517690. Charity registration No. 803793. Registered office: 104 New Kings Road, London SW6 4LY. Contact telephone number: 0207 371 9300. Trading arm: WI Enterprises Ltd: Incorporated in England & Wales - No. 1339906.